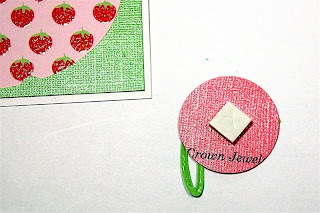 Today is my third day as Guest Designer for the Everyday Cricut blog. If you haven't already seen today's post you can find it at this LINK. The week is going by quickly and I have been very busy keeping up with two posts each day! 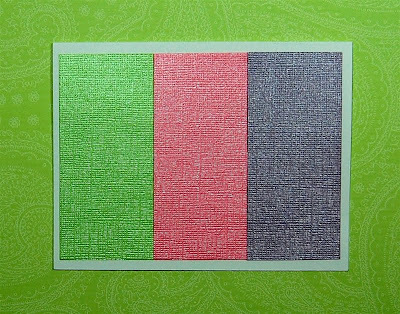 This photo shows how I trimmed up the sheet of Core'dinations gemstone cardstock I used for the cards I shared on Monday (shown in the photo below). 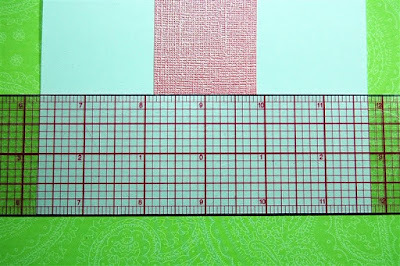 I have promised that I will show you ways to use up nearly all of the cardstock. I made the four cards you can see at the top of this post and I want to share a few details and tips for making the cards. 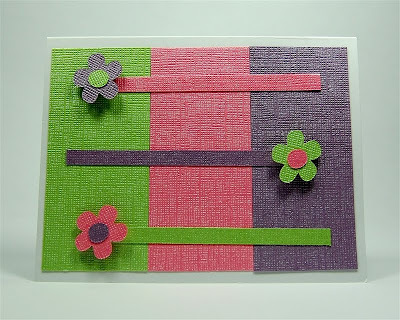 The first card could be used as a note card or you could add a sentiment along one of the horizontal lines. 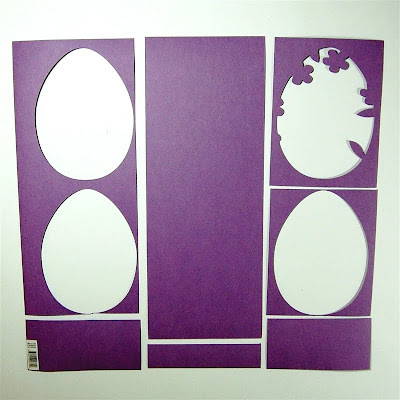 I used three of the two inch sections that I trimmed off below the egg cuts on the original 12 x 12 sheet of paper. 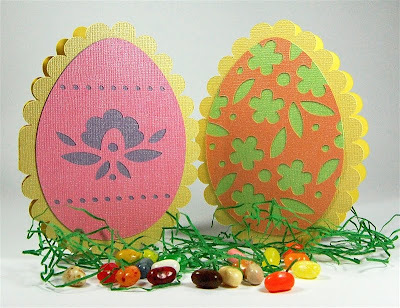 I also saved the decorative cut outs from the egg with the overall design. 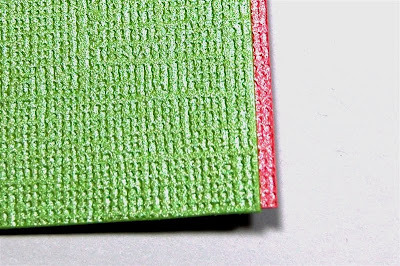 The narrow strips are 1/4 inch wide. 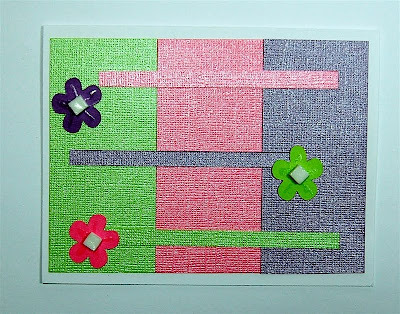 I trimmed them from the edges of the two inch strips to create three 1 3/4 inch sections to fit along the width of an A2 card with a bit of a border. Since the strips were each trimmed individually, they were not exactly the same length so I cut all three at once to trim the excess and make them line up evenly. The final length of the strips is about 3 3/4 inches. To center the placement on the card front I used my layout ruler. This is one of the tools I reach for many times each day. It has a centering feature so you can create even spacing on a card or layout. These rulers can be found at an art supply store. 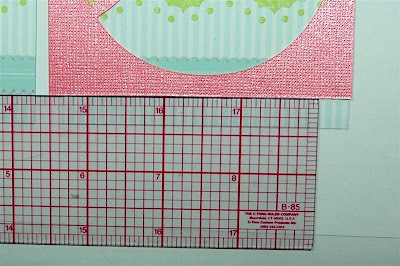 Once I found the center and positioned my pink strip to fit the length, I could "eyeball" the position of the strip along the height of the card front. I adhered all three sections with my ATG gun. This cardstock is thick and mine has a bit of a tendency to curl so don't skimp on the adhesive. I space the three skinny strips evenly in an alternating pattern. 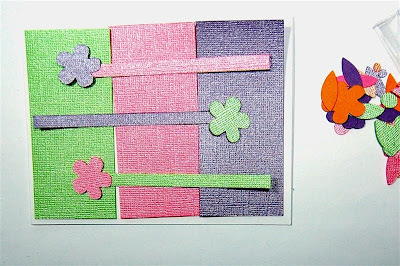 Foam squares for the backs of the flowers give the card a little pop! Contrasting centers (also from the egg offcuts) add the last detail. 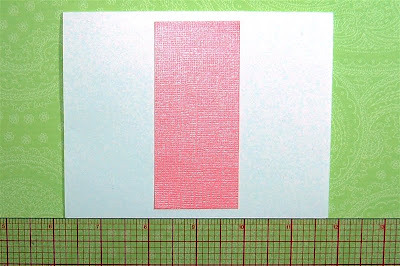 For the pink egg "Frame" I found this sheet of cardstock from the DCWV Sweet stack. I tend to buy these stacks but rarely use them to create a page layout. I liked the look of the paisley swirl and eyelet edging through the egg shaped opening. I cut a strip of the cardstock at 3 3/4 inches and then used my layout ruler again to figure out where to trim away the base to make the pattern appear in the position I wanted. I added a few green dots for the centers of the flowers. For tiny dots like these, it is easiest to put a dot of adhesive on the flower center and then drop the dot onto the adhesive. 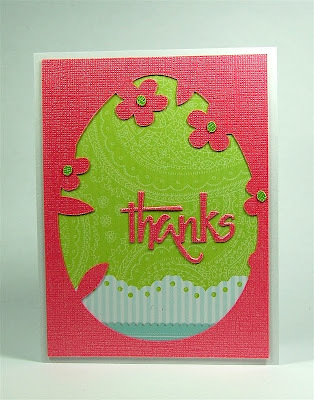 I cut the "thanks" from the pink gemstone cardstock with my Cuttlebug A2 Combo embossing and die set "With Gratitude." 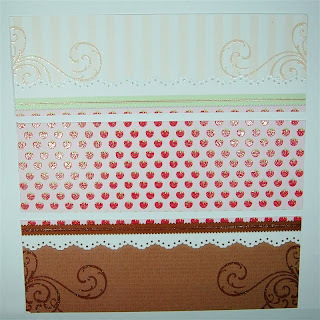 I used this glittered cardstock, also from the DCWV Sweet stack for the third card. The strawberries are so cheerful! 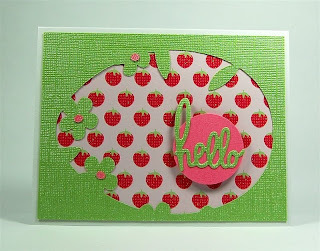 I cut the sentiment from the green gemstone cardstock with my Cuttlebug A2 Combo embossing and die set "Everyday Greetings." The green did not show up well against the strawberry pattern so I added a 1 1/2 inch punched circle from the pink scraps and turned it so the plain back side is facing up. The circle is raised on a foam square for dimension. Tiny pink dots are added to the centers of the green flowers. 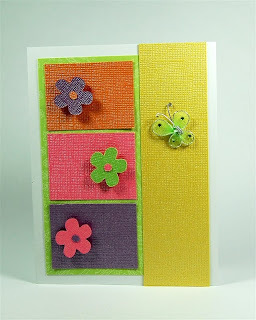 The last card is also created by color blocking. The yellow strip is 1 1/2 x 5 1/2 inches. The purple, orange and pink sections are 1 1/2 x 2 inches. 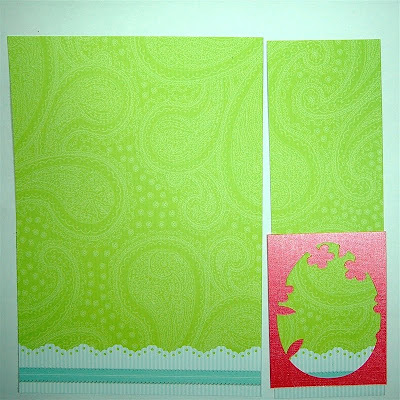 The green is the background is from the same sheet that I used for the "thanks" card and is cut at 3 3/4 x 5 inches. 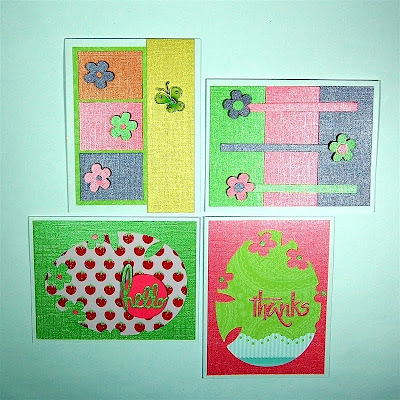 Flowers on foam squares and a green butterfly from Creative Charms finish the card. A sentiment could be added at the lower right corner. It really is a lot of fun to play with your scraps and see what you can make with all of the bits and pieces (and the occasional additional piece or two from your stash). 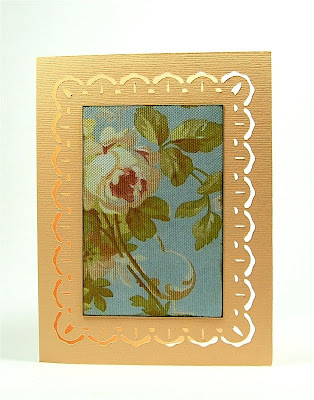 This lace border card is one that I created in Design Studio using only the Plantin Schoolbook cartridge. I gave a step by step lesson on how to create the file in my post on the Everyday Cricut blog - here is a LINK to the post. The link to download the file is below - but do have a try at making it yourself by following my directions. I'd love to see the cards you create if you use this idea. Great use of leftovers. Thanks. I am so grateful Everyday Cricut featured you. I have learned so much from your blog. I have added your site to my Favorites & will be checking it very often. Thank you. Diane, I would love to use Design Studio but I can't since I have a Mac and come from an all Mac family--my son is a Mac programmer. That is the main reason I got my Gypsy--so that I could finally do some of the wonderful designing too. I felt like I was being left behind. I loved your detailed instructions and will use the principals on my Gypsy. I am still hoping for a DS Mac version. As a Grammy I would like working on a bigger screen. Thank you--Thank you, I am learning a lot from you. Thanks for sharing. Now have the card saved on my Gypsy. Love your ideas for leftover scraps too. So glad for your knowledge!! Great little cards and very environment friendly when using up scraps! Diane, I love the way you "clean up" These "leftover" cards are beautiful. What an inspiration you are. Thank you for sharing. You are quite the recyler. That's very good. And all of your work is so beatiful. Another 10.